The Flight Framework is the evolution of an ActionScript framework that has been around for a few years. It was originally designed for web-based, design-centric applications such as product printers and book builders. Even now the framework ships with the CommandHistory – an entire solution for undo and redo – and other practical utilities that strengthen its offering. Flight Framework maintains an emphasis on supporting capable clients: Flex and Flash applications that are much more than just pretty faces to server implementations. Through features like domains (modular MVC systems) and a prescribed structure, the framework transforms component scripting into real application development. This Festivals held on Feb 23, 2010 in Online through Adobe Acrobat Connect with huge number of Audience across the regions. There were two Seminar rooms, a Chat Room, a Gallery and a Adobe Store had created to make the festival in a great and much interactive way. Room I for Photoshop and other related suites (Design Premium Suites). Room II for Flash, Web2.0, Flex, Action Script and Photography. Since it was the parallel tracks, I have attended only the Seminar Room II sessions. 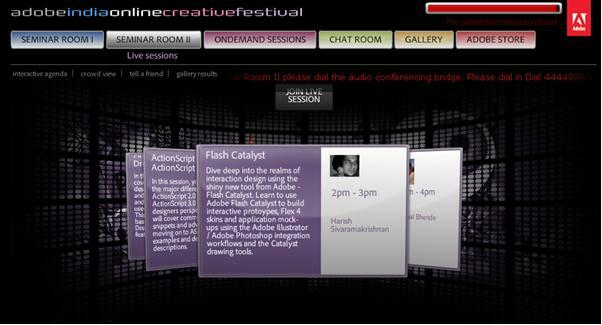 A Chat Room to chat with Adobe Experts for instant doubts and queries from the sessions. Gallery – You can upload your own creativity stuffs created with the help of Adobe Products. It can be an Audio, Image or SWF. Great way to promote yourself..
Adobe Store – good opportunity to become a Ambassador of Adobe India. I simply subscribed since I’m a great fan of Adobe. If god wishes, I will become a Ambassador of Adobe India, not an easy task but have to work hard.. Let’s see.. These two above sessions are my favourite one 🙂 .. So I simply taken screen-shots. Oh ! oh !..Other sessions were also great .. But I’ve already had some experience with other session demos, so I didn’t concentrate much on that. He spoke a lot about Dreamweaver CS4 , Fireworks CS4 and Flash CS4 for creating Web 2.o apps. I had a great time by knowing some cool tips and tricks from these two sessions. He also shared some clear and confined details on Action Script 2.0 (AS2.0) and Action Script 3.0(As3.0), some doubts were cleared from my popping mind .. If you would have attend these sessions, definitely you would have been enjoyed on these products ..
Oh! Oh! 😉 .. Coming to Harish’s session, I had attended many sessions of Flash Catalyst by him.. All are pretty unique and clear demos.. Keen to watch his space for the upcoming secrets from Adobe. He said we may expect a full version of Flash Catalyst and Flash Builder in this year. 😉 How great ! ! ! Can’t wait Adobe.. This is the cool and nice session for Photographer, if you would have attend this session, you would definitely try to become a Photographer .. not joking guys.. He has shown some cool tips/tricks and work flow of Photoshop, LightRoom and Bridge CS4. LighRoom is the much needed product for Photographers. I knew you’re gonna start using Adobe Suites. See you with another awesome suite experience..